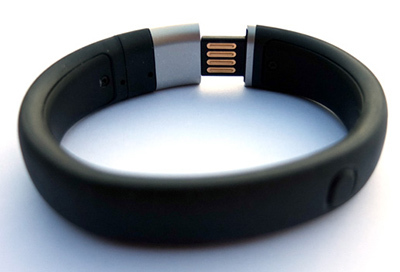 Register Hardware have published a review of Nike's latest activity monitor band. 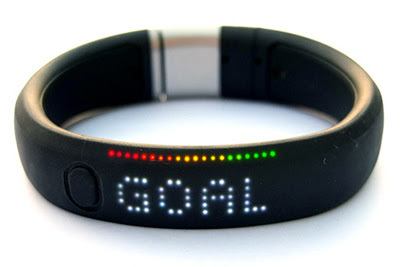 "In an increasingly crowded market, the Nike+ FuelBand stands out because of its neat design, clear display and convenient size." "It would have been good if it could monitor your sleep, as Jawbone Up and Fitbit can, or wake you with a gentle vibration, but the main benefits are enough." "It can quickly become addictive, so if you’re near your target as the day wanes, you find yourself going for a walk just to see the GOAL screen light up. Which is no bad thing." 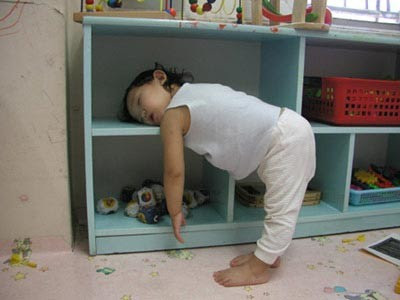 Research published in Sleep suggests the best nap length is just ten minutes. The 5-minute nap produced few benefits in comparison with the no-nap control. The 10-minute nap produced immediate improvements in all outcome measures (including sleep latency, subjective sleepiness, fatigue, vigour, and cognitive performance), with some of these benefits maintained for as long as 155 minutes. The 20-minute nap was associated with improvements emerging 35 minutes after napping and lasting up to 125 minutes after napping. The 30-minute nap produced a period of impaired alertness and performance immediately after napping, indicative of sleep inertia, followed by improvements lasting up to 155 minutes after the nap. For the ideal time to nap, click here. 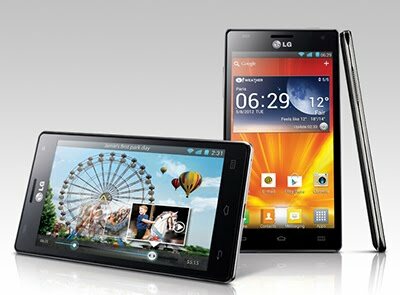 Register Hardware has published a very positive (90%) review of LG's latest quad-core, £425 Android smartphone. "The 4X HD is not only the cheapest quad-core around, it's also the smallest and lightest. It may not shout "Look at me" like the opposition, but it’s a smart and solid bit of kit. Furthermore, it has a very well thought-out storage arrangement and some clever UI additions. Add to that the beefy removable battery and regular-sized SIM card slot and I think we have a winner." 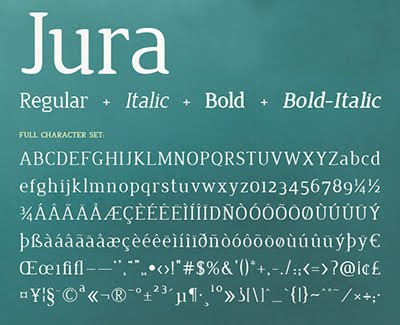 Jura is an elegant serif typeface of narrow proportions with distinguishing details. The rounded, wedge shaped serifs offer a more contemporary feels than many serif fonts, while maintaining legibility even at small sizes. 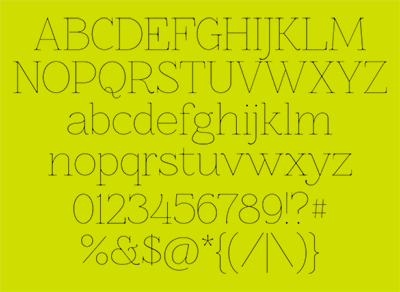 This new release of the Jura family includes four fonts: Regular; Italic; Bold & Bold-Italic. Each variant now includes 241 characters (that's 85 more than the original) and every glyph has been completely redrawn. There's even a couple of ligatures in there. 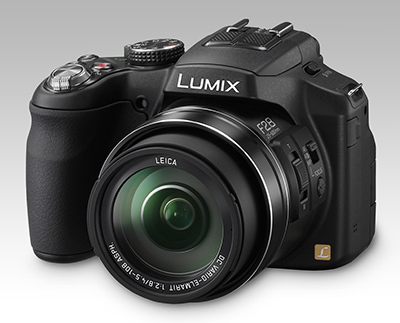 The DMC-FZ200 is a 24X superzoom with a constant F2.8 lens and high-resolution electronic viewfinder. It has a 1.3m dot equivalent electronic viewfinder and the ability to shoot at 12 frames per second and can capture 1080p video at 60fps or 720p at up to 120fps. The camera's 25-600mmm equivalent lens features an improved version of the company's highest-grade stabilisation system. 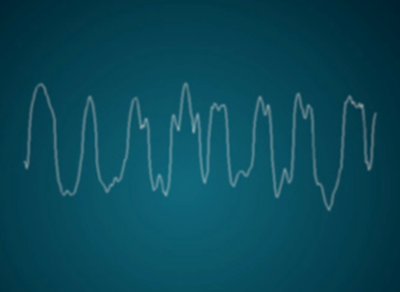 Chirp plays a two-second long noise that sounds as if it was made by a robotic bird. When heard by other devices it triggers a download. At the moment users are limited to sending pictures, website links or 140-character text messages. These appear in a feed similar to Facebook's timeline. Chirp is available as a free iPhone app. 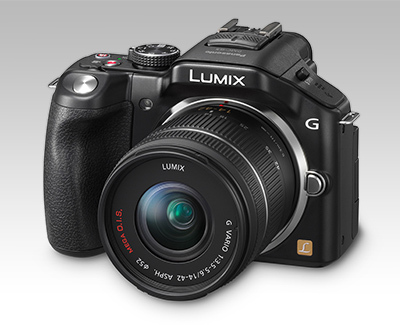 The LX7 features a slightly smaller sensor than the LX5, allowing it to offer the brightest lens of any compact camera with a F1.4-2.3 24-90mm equivalent range. 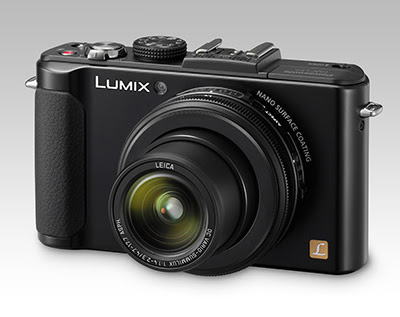 The LX7 is based around a 10.1MP MOS sensor, rather than its predecessor's CCD, allowing it to offer 10 fps continuous shooting and 1080p60 movies (50p for European examples) in AVCHD Progressive format, or half that rate in MP4. It also gains an aperture ring around the lens, a 920k dot LCD, and finds room for stereo mics and a larger accessory port, allowing use with an optional high-res electronic viewfinder. 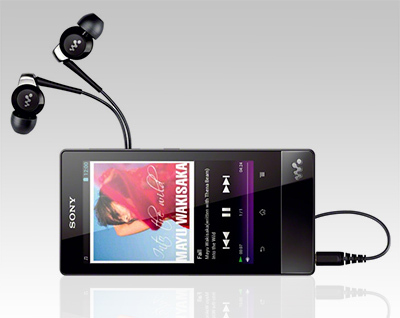 The Sony Walkman F800 has a 3.5in display and runs Android 4.0 Ice Cream Sandwich, providing access to Google Play and its wide array of apps and games. It comes in 8GB, 16GB and 32GB sizes, connects through Wi-Fi or Bluetooth, and should pump out up to 36 hours of audio from a single charge, if Sony's battery life claims are true. The Japanese giant also revealed further Walkmans - including the Bluetooth-focused S770BT Series, the noise-reducing E570 Series, and the colourful E470 Series, which comes with a portable speaker dock powered by the device's internal battery. The G5 is built around a 16MP LiveMOS sensor that the company implies hasn't been used in a G-series camera before. This, combined with the company's latest 'Venus Engine' allows the capture of 1080p video at 60 frames per second (50p in European examples). It also gains an additional control lever, higher-resolution 920,000 dot rear LCD and regains the eye-sensor to automatically switch between LCD and electronic viewfinder. 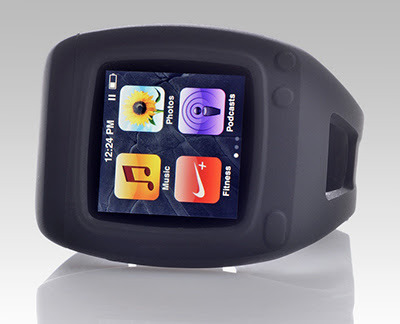 The Lion Hound Technology SYRE transforms your iPod Nano into a smart watch. Moulded from silicone polymer, SYRE provides a comfortable fit that allows for airflow to the wrist while protecting your Nano from damage caused by impact or perspiration. By integrating the Bluetooth attachment into the watch case and removing the need for cumbersome wired headphones and unsightly adapters, SYRE gives athletes a full range of motion while active and a sleek, cordless experience while relaxing. Thanks to Dan Graham for the heads up. The Hövding Invisible Helmet is a fabric collar containing a built-in airbag designed to inflate around a cyclist's head on impact. The fabric shells of the collar are replaceable and meant to be changed based on weather and style. 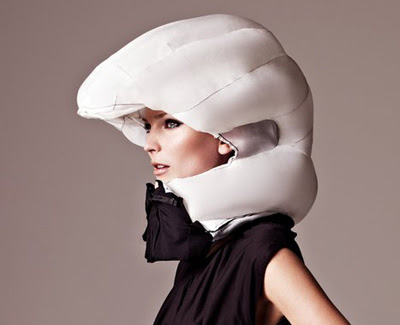 The Hövding Invisible Helmet is available from $600. 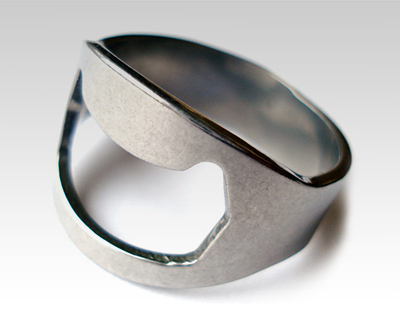 Nice idea by Jared Fiorillo, available, gift-boxed, at Etsy for £10. Building a satellite, that's not really much of a problem anymore. Getting them launched, well, that's what separates the big boys from the wannabes. Virgin's Richard Branson believes he has the answer to that - LauncherOne. The delivery system for Earth orbiters is based around the WhiteKnightTwo, the same launch platform used by SpaceShipTwo to reach its sub-orbital heights. The tube-like rocket of the LauncherOne is carried up to 50,000 feet by its mother ship, before detaching and initiating its two-stage rocket engines. The current design is capable of delivering 500-pound payloads into Low Earth Orbit, while lighter satellites of 225 pounds could reach Sun-Synchronous Low Earth Orbit. Virgin Galactic says it has already signed up its first customers, including SkyBox Imaging and GeoOptics. 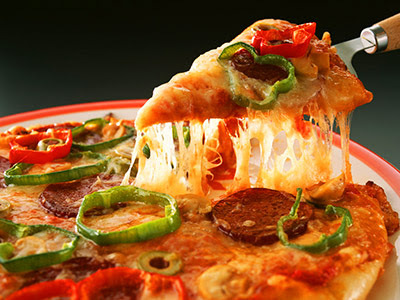 A scientist has created what he claims is the first nutritionally balanced pizza. The pizza, claims Mike Lean [! Ed.] from Glasgow University, UK, contains 30 percent of an adult's guideline amount of vitamins and minerals, as well as a third of the recommended amount of calories, protein and carbohydrate. "I researched the market and found that seaweed was an interesting new ingredient being used in artisan bread. So we used that as a way of reducing the salt level. The sodium content of seaweed is about 3.5 percent compared to 40 percent in salt. There's iodine in there, vitamin B12, all sorts of things. And the flavour is excellent as well." Elsewhere, the tomato sauce contains extra red pepper for a boost of vitamin C, and each pizza features extra magnesium, potassium, folates and vitamin A. Each pizza contains the exact proportions of calories, proteins, fat, carbohydrate and nutrients to make it a single, meal-sized way to obtain 30 percent of your recommended daily intake. There's obviously one big question here, though: how does it taste? People won't have long to wait long before they find out for themselves: they go on sale in UK supermarkets later this year. At launch there will be a standard margherita and a venison-topped version, with more toppings to be announced. 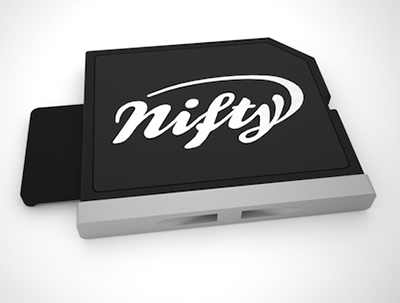 The MiniDrive is designed to sit completely flush with the body of the MacBook. Want an ultra thin, half-way-decently-drawn fancy serif? Pay a visit to Font Squirrel. The magnesium-bodied EX2F features a 1/1.7" 12.4MP BSI CMOS sensor and the fastest 24-80mm zoom lens of any compact camera on the market (F1.4 at 24mm to F2.7 at 80mm). ISO sensitivity can be extended up to ISO 12,800 and as well as various still image modes the EX2F can also capture full HD 1080/30p video. The 'F' in the model name designates WiFi, and features the full complement of 'Smart' options offered by its high-end NX cousins, including Mobile Link, Remote Viewfinder, Email and Auto Backup. The EX2F will be priced at $549 and will be available in August. 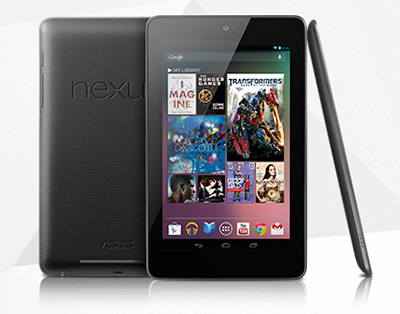 Google's 'Kindle Fire killer' is available for pre-order, starting at £159 for the 8GB version. 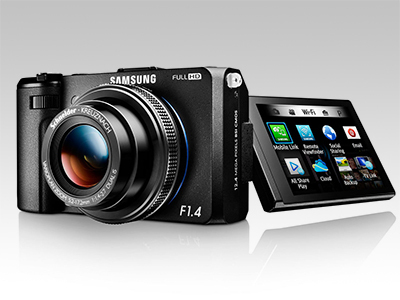 For engadget's (very favourable) review, click here. 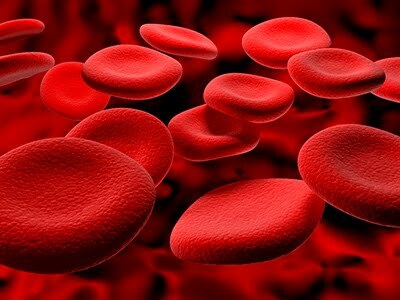 Researchers have designed microparticles that can be injected directly into the bloodstream to quickly oxygenate your body, even if you can't breathe anymore. It's one of the best medical breakthroughs in recent years, and one that could save millions of lives every year. The invention, developed by a team at Boston Children's Hospital, will allow medical teams to keep patients alive for 15 to 30 minutes despite major respiratory failure. This is enough time for doctors and emergency personnel to act without risking a heart attack or permanent brain injuries in the patient. The particles are composed of oxygen gas pocketed in a layer of lipids, a natural molecule that usually stores energy or serves as a component to cell membranes. Lipids can be waxes, some vitamins, monoglycerides, diglycerides, triglycerides, phospholipids, or — as in this case — fats.